As the leaves crunch beneath your feet, visions of hayrides, corn mazes and pumpkin patches come to mind with this fabulous fall fragrance. Cinnamon, orange zests, marshmallows, brown sugar, nutmeg and more all blend together perfectly to form this complex fragrance. Save big by ordering a complete reed diffuser gift set ! No need to order all the components separately ! Our gift set contains everything needed to start diffusing immediately ! 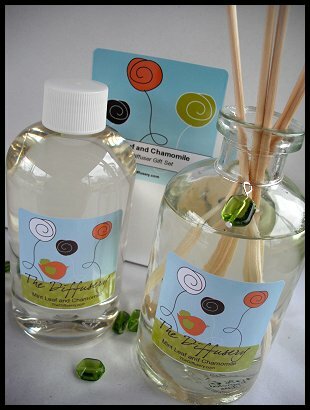 Our reed diffuser gift set contains an 8 oz. glass apothecary diffuser bottle with bottle charm and cork, wooden diffuser cap, 8 oz. bottle of scented reed diffuser oil, 8 premium rattan reeds, a no-mess funnel to fill your bottle and a coaster to protect your delicate surfaces. This beautiful gift set comes packaged in a white gift box and is tied with a delicate organza ribbon and includes a gift card for easy gift giving !